Creatures of the Night at ZooTampa! Creatures of the Night returns to ZooTampa at Lowry Park as a bigger and better event for ghouls and goblins of all ages. On Fridays and Saturdays from October 5-27, the Zoo stays open late and animals lurk in the night until 10 p.m. with a haunting array of eerie and immersive Halloween adventures for the whole family. The family-safe event has no horror or gore, just an impressive lineup of endless scares and startles for one and all. 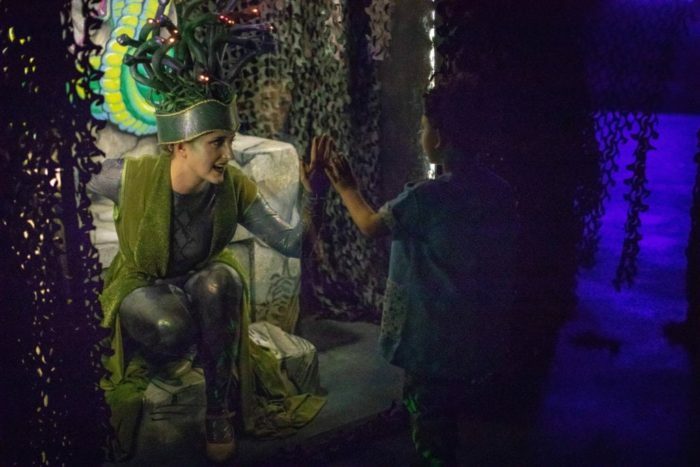 This year, brave explorers will meet Medusa, the Serpent-headed Gorgon Queen, as she steps out of the pages of mythology and into the darkest shadows of the Zoo. In Medusa’s Stone Cold Cave, guests risk heeding the ancient warnings or become a permanent member of her chilling garden of statues! Legend warns that those who look her in the eyes are so overwhelmed with fear, they turn to stone. Despite Medusa’s scary appearance, snakes like those replacing her curly locks are critical to our local ecosystems and Zoo educators will share their importance to guests. Fairy Frightful Forest, is the perfect new family adventure. This enchanted woodland is filled with overgrown flowers, huge mushrooms and whimsical fairies until suddenly, everything takes a dastardly and diabolical turn! Little ones may leave the forest at this point while older kids, pre-teens and adults can continue their ominous journey. Brave guests who stay on the path will be face-to-face with frightening trolls and menacing trees that have come to life. The Zoo is also accepting students at the new, Pigpimples School of Mystery and Mayhem, where families can enjoy a Halloween themed, animal show featuring the Zoo’s famous animal ambassadors and their natural behaviors as never seen before. Spooky surprises await in every area of the Zoo!Werewolves return to Wolf Haven Village, the perfect place to howl and dance, while mischievous ghosts invite guests to ride Carousel of Creeps surrounded by a ghostly graveyard. Swashbucklers can play with headless pirates and listen to pirate tales in Haunted Key West.Scarab Point is designed for brave little adventurers to explore an ancient Egyptian tomb and meet history’s most alluring queen, Cleopatra, along with her playful mummies. Little “boos” and “ghouls” can have fun in Pumpkin Palooza, a festive fall harvest complete with a pumpkin patch, scarecrows and friendly farm animals. Away from the scares, guests will get a glimpse into the nighttime habits of animals and discover what nocturnal creatures are most active. Featured animal presentations will include some of the world’s most feared predators and guests will observe the unique hunting and feeding behaviors of Komodo dragons and African painted dogs with special carcass feedings at their habitats –moms and dads may want to accompany small kiddos. The event is free and unlimited for Zoo members and included with daily admission. Guests with a “Pay for a Day” ticket can enjoy the event for free on Friday nights and before 4:00p.m. on Saturday nights.